The beautiful country of Japan boasts of unique and peculiar sightseeing experiences to the visitors. Though it’s good to visit the country during any time of the year but spring has its own forte. This is the season of flower blooming, as the whole country is immersed in the beauty of cherry blossom and plum flower. Typically, the plum flowers bloom in the early spring and continue for a longer duration. Family and friends enjoy together at the hot spots and soak in the glory of plum flowers. They revel and party till late night and relish good foods and drinks on the location. This season continues for a good part of spring months. Once the plum trees start shedding their flowers, cherry blossom festival sets in. This festival is one of the major attractions in Japan during the spring season. Tourists from around the world flock this country especially to view blossoming of cherry flowers. There is a special term for flower viewing in Japan, Hanami. 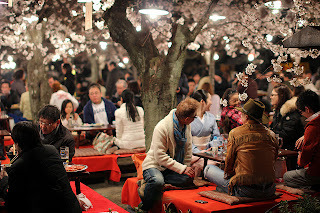 This term can also be referred to taking a walk under or partying under Sakura trees. Hanami parties are quite popular in this country. Virtually, you can find whole country participating in such parties at different locations. It’s a tradition in Japan to reserve the party spots by placing blue coloured plastic mats under the Sakura trees. You can see people rushing to reserve the spots as before as 12 hours from the party time. Most commonly, junior colleagues at the work places are entrusted with the task of reserving the party spots. The blue mats are treated as if a house floor. People do not step on mat in shoes. An old saying goes in Japan, dumplings over flowers. It suggests that foods and drinks and not the flowers are most interested things in Hanami parties. However, you might see a quiet and introspective affair at a few party spots but most of the Hanami parties are wild and fun-filled.